If you are an experienced motorcycle rider currently licensed in New Mexico with a “W” motorcycle endorsement, have a very good driving record and good basic riding skills, you may qualify to become an MSF-certified NMMSP RiderCoach. If you qualify, you will need to complete an intensive RiderCoach Preparation course in order to teach. During the RiderCoach Preparation (RCP) course you'll learn the fundamentals of teaching the MSF's Basic RiderCourse (BRC). In New Mexico, RiderCoaches are employed by the NMMSP. Before contacting MSF to enroll in a RiderCoach Preparation course you should contact the NMMSP sites in your area to see if they are looking for RiderCoaches, just like applying for any other job. You need to be sponsored into a RiderCoach Preparation course by a NMMSP-recognized training site in order to be considered. Who teaches the RiderCoach Preparation course? MSF-certified RiderCoach Trainers teach the course. These specially trained individuals have completed the MSF's RiderCoach Trainer Preparation Course and are authorized to train candidates for MSF RiderCoach certification. You must be sponsored by a NMMSP training site and have them submit your application to MSF. You must be a licensed motorcyclist who currently rides on a frequent, routine basis. You should have several years of varied riding experience. As a teacher, you need good communication skills. As a RiderCoach, you'll be called upon to give your time to help teach RiderCourses. Although you may get paid, you won't become rich. A sincere desire to help reduce motorcycle accidents, injuries, and deaths is the prime motivator of RiderCoaches. The training sites and/or the state program management must retain the signed application affirming compliance with the requirements, including the proof of education. The RCP is a minimum of 56 hours. As a part of the course, you'll be required to pass a riding-skill test. It is the same test used in the BRC; however, the standards are higher for RiderCoach candidates. During the RCP, you'll learn how to teach the BRC curriculum. You'll practice teaching in the classroom and learn how to manage the range exercises and how to evaluate and coach students as they develop their riding skills. At the end of the training portion of the course, you'll be given a knowledge test. You must pass it to continue in the program. The RCP culminates when you and your classmates teach a complete BRC to a group of new riders. Your teaching performance will be evaluated by the RiderCoach Trainer. Course schedules will vary; you should plan on 7 to 10 days of focused training. NMMSP RiderCoach Preps may be conducted over two or three weekends: the weekends may be 3, 4, or 5 day periods – the schedule will be announced at least 2 months in advance of the Prep. When is the RCP course offered? Typically a course is offered when there is a need for RiderCoaches in a particular area. Generally, courses are offered once or twice each year in NM. At this time, there is no tuition to attend an RCP, but there is a $50 books/materials fee that is refunded when the applicant completes the RCP. Applicants are responsible for their own traveling expenses. If you enroll in a course, be prepared to ride! Every day! 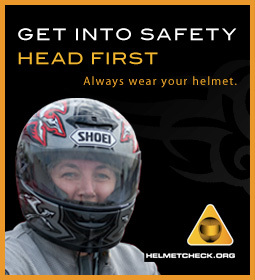 Required riding gear includes a DOT-approved helmet; over-the-ankle, sturdy leather footwear; long pants; long-sleeved shirt or jacket; and full-fingered gloves (preferably leather). NMMSP requires you complete the NMMSP RiderCoach Candidate Apprentice Program and a Basic RiderCourse prior to the RiderCoach Preparation (RCP) course.